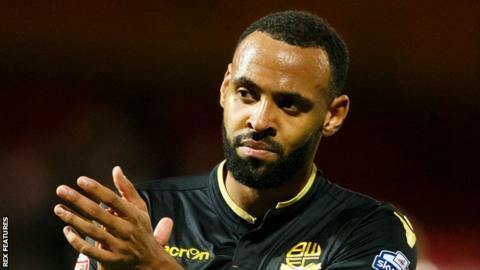 Bolton Wanderers midfielder Liam Trotter has apologised for making an offensive gesture with David Wheater in a pre-match live club broadcast. The club has fined the pair for the incident, which happened prior to Tuesday evening's defeat by Brentford. "I'd like to apologise to the Bolton fans for what we did before the game," Trotter, 27, told BBC Radio Manchester. "We didn't realise it was live, it wasn't aimed at the fans or club, it was a silly gesture as we walked in." A club statement said: "Bolton Wanderers takes the conduct of its players and staff extremely seriously and will not tolerate such behaviour." The defeat, Bolton's 22nd in the Championship this season, means they could be relegated to League One on Saturday when they face Derby County. The club have spent much of the season fighting a relegation battle, as well as off-the-field financial problems, and are 17 points adrift of safety at the bottom of the table with six games left to play. "It's too hard to pinpoint one thing, there's a lot of things gone wrong. If we knew what the problem was then we would be doing better," said Trotter. "There's a lot of factors, a lot of outside influence with what's been going on at the club, but it's not just that, the players haven't been good enough this season. "We haven't done enough on the pitch. We're in the position we're in because we deserve to be."